The Doctor of Philosophy in Nursing program is designed to prepare nurse scientists who will assume a variety of roles in education, research, leadership and health policy. The holistic review process is used when considering applications for admission to the PhD Program in Nursing. generate knowledge, test interventions and evaluate outcomes to reduce risks of illness/disability and promote quality of life. collaborate with other disciplines to improve the delivery of health care. assume research, leadership, executive, public policy and/or teaching roles. affect health policy through the application of scientific knowledge. See what students and alumni say about our program. BSN to PhD: BSN to PhD students complete the first year of coursework at the master’s level and then continue on to doctoral level work. MSN to PhD: The MSN to PhD students enter directly into doctoral coursework. The BSN-PhD and MSN-PhD programs are offered on-site. While the majority of courses are face-to-face, some cognate courses may be offered on line. Most courses are offered in a traditional semester long format; however, selected nursing core courses may be offered in an intensive format. Full or part-time programs of study are available. Each student’s plan of study includes required core courses and elective courses based on individual student interests. 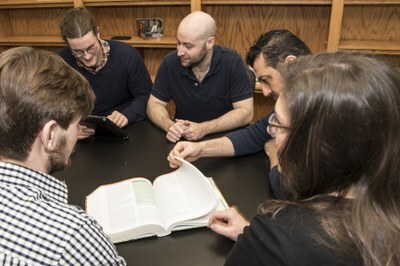 In addition to course work, students receive intensive mentoring by experienced faculty researchers. Emphasis is placed on developing relationships between established and developing scholars to facilitate student success in research, grant writing and dissemination activities. Following completion of course work, students take a qualifying examination. A dissertation is required once coursework is completed and the qualifying exam is successfully taken. The dissertation may be completed in a traditional or manuscript option format. Applications may be considered after the deadline on a space available basis. The holistic review process is used when considering applications for admission to the PhD Program in Nursing. The holistic review considers multiple criteria for admission, including: the applicant’s professional career goals, academic capabilities, GPA, GRE scores, research interests, RN license, area of expertise, community engagement, and potential for scholarly career in nursing. UofL Graduate Application available online at graduate.louisville.edu/apply. Transcripts. If BSN applicant official transcripts from all undergraduate college course work with a cumulative grade point average of at least a 3.0 on a 4.0 scale. If MSN applicant official transcripts from all undergraduate and graduate college coursework with a cumulative graduate grade point average of 3.25 on a 4.0 scale. Bachelor’s degree must be from an institution with a NLN or CCNE accreditation. Applicants who have attended a college or university outside the United States are also required to submit an evaluation of their transcript through World Education Services (WES) or Educational Credential Evaluators (ECE). Please note that transcript evaluations can sometimes take several weeks. Graduate Record Exam (GRE). Scores that indicate strong verbal, quantitative and analytical potential. Successful candidates generally have an analytical score of 4.0 or higher. For GRE scores prior to August 2011, successful candidates generally have a combined Verbal and Quantitative minimum score of 1100. For GRE scores from August 2011 and after, successful candidates general have scores of 156 Verbal and 146 Quantitative. Test information is available at www.ets.org. Students for whom English is not their primary language must show English language proficiency by 1) demonstration of a degree awarded from an acceptable English language institution or 2) acceptable examination: TOEFL; International English Language Testing System (IELTS); successful completion of the exit examination for the advanced level of the intensive English as a Second Language Program. Recommended test scores are available on the University International Student website. Three Professional Letters of Recommendation from individuals who can speak of academic and/or professional capabilities and potential for a scholarly career. Recommendations should be chosen from among: former faculty members, current or immediate past employer, or other nursing/health professionals. Each person providing a recommendation for you must complete the UofL Graduate School Letter of Evaluation form. This form is available on line at https://sharepoint.louisville.edu/sites/SIGS/Documents/grad-rec.pdf At least two references should be from nurses. Recommendations forms/letters must be completed within the last year. A current curriculum vitae or resume. Include nursing license number on resume. International students need to be licensed as registered nurses in their country of origin, if licensure is available. If direct patient care activities are provided, a Kentucky RN licensure prior to December in their first year of study must be obtained. A written statement of career goals, area(s) of expertise, research interest, and reasons for pursuing doctoral studies. Maximum three pages; double spaced; 12 point font. Completed online Legal Questionnaire. Link will be provided with the receipt of application confirmation. Personal interview with School of Nursing faculty will be required. A Certified Background Check - Please complete the background check through this link. The school code is Ni53bc. You will not send this information to the School of Nursing, as it is handled through the outside agency. If you have issues with the background check, please contact customer service at 888-666-7788 Toll Free. Tuition information is available through the UofL Bursar's Office. Visit Campus Health website for individual costs. Required for UofL campus parking. Costs vary. Full-time students can apply for fellowships and assistantships to support their doctoral studies. Fellowships provide tuition, a stipend and health insurance for one to two years without a work requirement. Assistantships provide tuition, a stipend and health insurance in exchange for a 20 hour per week work requirement as a graduate research or teaching assistant. Fellowships and assistantships are awarded on a competitive basis. Applicants must consider a number of factors when considering how to pay for graduate school. The following resources will help in the process. Q: What is the focus of the PhD program? A: The program is designed to prepare nurse scientists who may assume a variety of roles in education, research, leadership and health policy. A: BSN to PhD full-time students complete coursework in three calendar years and then focus on completion of their dissertation. MSN to PhD full-time students complete coursework in three calendar years and then focus on completion of their dissertation. Students may attend on a part-time basis and time to completion varies by the number of credits completed each semester. Q: Can you be a part-time student? A: Yes. Please review residency information below. Q: Is there a requirement for full-time residency? A: To assure that students have the opportunity to utilize the educational facilities fully and to participate in the intellectual life and research atmosphere of the University, at least two years of study must be spent at the University of Louisville and at least one must be spent in full-time residency. To be considered in full-time residency for one year, a student must be registered for 18 hours in a 12 month period. Q: Can I transfer in hours? A: Yes. The maximum number of semester hours transferable, upon request, is six. Up to six additional hours may be requested and considered for special approval. Credits which have been applied toward an earned degree may not be applied toward the doctoral nursing degree. Q: Are there any courses required prior to starting the program?